More than a sidelite with hinges. Offers ventilation without the need for obstructive storm and sliding screen doors. 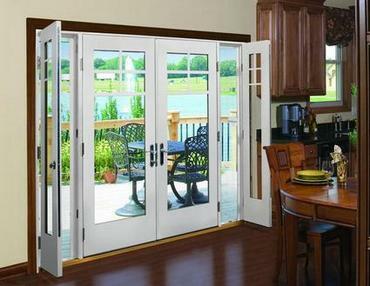 Features wide patio mullion for structural strength when doors and vented units are open. Door stile edges provide additional strength, and anchor hinges and handle sets. Screen tab system ensures secure, tight closure. Special multi-point lock gears provide enhanced safety. Available Sizes: 5’8″–7’8″ widths in 6’6″ and 6’8″ heights. Configurations: Available in single and double units for inswing applications. Glass Options: Fits the Therma-Tru® full-lite glass offering – 18 decorative, clear Low-E, clear and grilles between glass options.